The doubles format has been an integral part of the Sydney Subbuteo scene since the 70s. Back in those days, when we played as clubs – Liverpool, Derby, Burnley, Bayern, Frankfurt et al — the doubles matches were considered to be ‘internationals’. The Hosie brothers teamed as ‘England’, the Kennedy boys as Australia, etc. 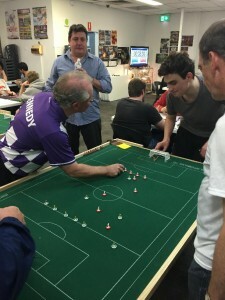 The games were dramatic, adding an extra dimension to the game we all loved: combined moves, ‘volley’ shots, and the constant chatter between teammates on tactics, best flicks, positional and blocking flicks. 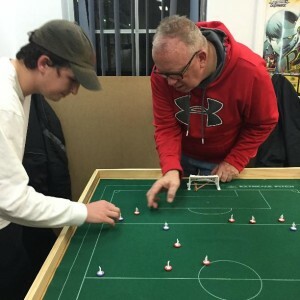 Since the revival in 2010, we’ve played the odd doubles game, and have always promoted it as a great way to introduce the game to new players: pairing with someone more experienced to get advice on flicks and tactics. We staged a small event on Friday in honour of our late friend Don Hosie, who was a great proponent of the doubles format. Rather than a standard event, we ran the doubles using a ‘SuperMelee’ used in petanque, where the pairings change in each round. Two newcomers — Ben Codling and Todd Giles — made their debuts at GoodGames, though Todd had played at the interclub the previous week. Ben (son of former player Stuart), picked it up very quickly and even scored a cracker in one match. Gary Hosie made his comeback and showed he still had the deft touches, positional play and ability to read the game two or three flicks ahead. Geoff Sirmai made his first fick in almost 30 years and quickly got back into the rhythm, while Stuart Codling also showed his straps. 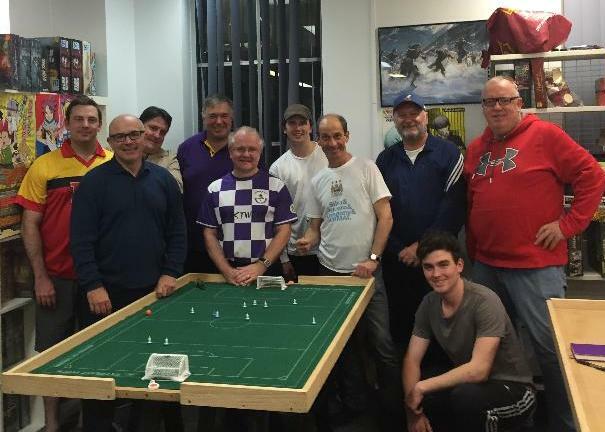 It was great to see some of the pairings, with Eliot and Louis in fine form to beat Simon Cole and Stuart, while Gary and Steve scored four to beat Dom Grenot and Ben, Gary scoring twice in the first half. With a couple of players leaving early, we revised the final placings based on success percentage, with Gary and Eliot sharing first place, Steve coming second and Stuart taking third. Best newcomer was Todd. This entry was posted in News on 26/07/2015 by Steve Dettre.